Girl Scout cookies. They're kind of a big deal. And if you haven't gotten the shake-down yet from your local green-sashed entrepreneur, you will. Oh, you will. But despite cute smiles and heart-warming pledges to create a better world, there's one thing those thin mints can't give you. Booze. Move over, girls. Let mama show you how it's done. These adult thin mints are creme de menthe infused wafers, dipped in chocolate and mint coating. And if you've always been a sucker for those green trefoil boxes, you'll fall head over heels for the boozy version. 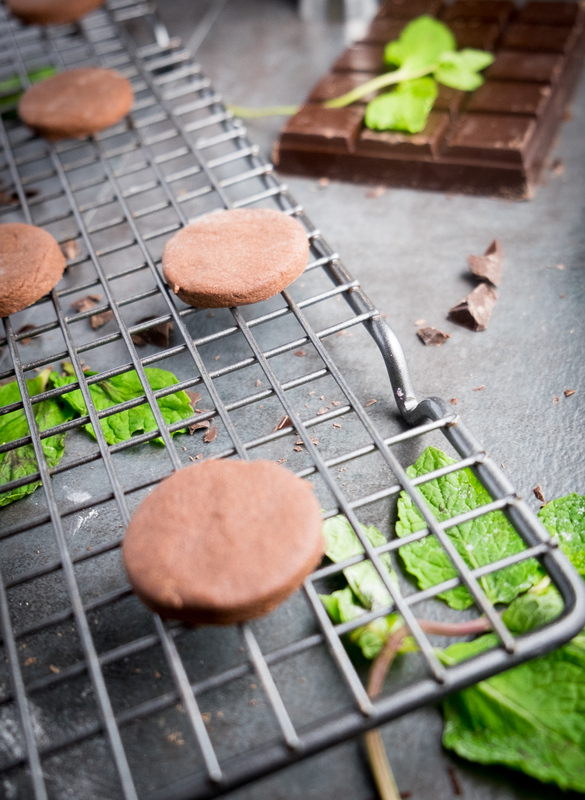 These minty cookies begin with just a few simple ingredients. And that bowl in the middle? All booze. You're welcome. You're going to be tempted to just start pitching forkfuls of dough into your mouth. And I'm not gonna lie. That's not the worst idea you've ever had. But this recipe gets better so just hang on. Yeah, see? Aren't you glad you waited. Cut these circles out and slide them into the oven. But they're missing a little something, right? Yep. Let's go for a little dip, shall we? I use coconut oil for chocolate coating because a little birdie told me it's the only reliable, reasonable thing to do. It makes chocolate not seize, but it also taste amazing. I felt like our boozy scouts needed some more flavor, so I kicked it up a notch with some more creme de menthe in the coating. And there you have it, kids. Boozy Thin Mints. An adult-only Girl Scout cookie that'll give your local troop a run for their money. Until next week, keep it sweet and mostly sober. Cream softened butter, then add powdered sugar, mixing until combined. Stir in salt, creme de menthe and cocoa powder. Add the flour and mix until combined. Form dough into a ball, flatten into a disk, cover in plastic wrap, then freeze for 15 minutes. Remove from the freezer and roll it out to about 1/8-inch. Cut cookies using a round cookie cutter. (I used a shot glass). Put cookies on a baking sheet and bake 10 minutes. Remove from oven and cool on a rack. For the coating: Chop the baking chocolate. Melt with coconut oil in a double boiler until smooth. Slowly stir in creme de menthe. If you like your cookies extra minty, you can add 1 tsp. peppermint extract here instead. Dip cooled cookies completely in chocolate coating. Place on parchment or wax paper and set in freeze or fridge to firm. Can't get enough boozy baking? Follow A Sweet Little Life on Facebook.